First of all, the results in the figure below are not complete. In fact, the results of single parties are not there: in regional elections, mainstream parties are linked to small local coalitions and minor parties. Therefore, the candidates of major parties always receive support from other lists, and the single party (e.g. 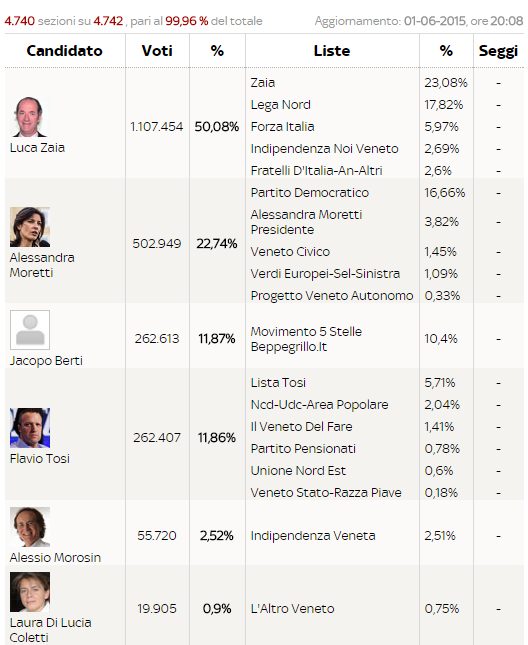 Lega Nord in Veneto: 17.82% out of a total 50.08%) scores lower than that shown in the chart. From this story we can get a general observation, three political factors, and one classic example of “politica all’italiana”. The general observation: abstention. There is a clear winner, and it is composed of all those citizens who did not vote. The turnout is a little lower or higher than 50%, generally 10% less compared to the last regional elections. Dissatisfaction, disillusion, disenchantment. Or, more pragmatically, refusal of this political class, unable to bring Italy outside of the doldrums of the crisis. The political factors. First of all, Beppe Grillo and Matteo Salvini (Movimento 5 Stelle and Lega Nord) are strong, and they both compete for the second place close to the Democratic Party, exploiting the same attitude towards mainstream politics. Blaming the elites is easy, condemning the immigrants and the Roma people even more, and being against the Euro is a must. While waiting for the implosion of the alternatives, they enjoy a partial victory. 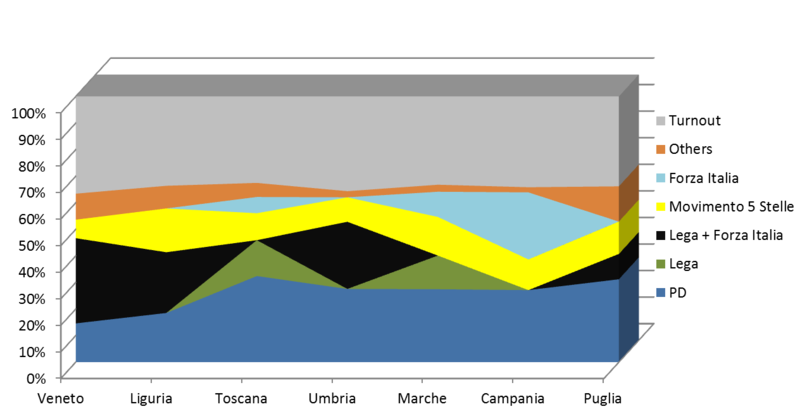 Second, the relationship between Berlusconi and the Lega Nord has been finally reversed. Berlusconi, after a “ventennio” marked by political machismo, has to face reality and abdicate. His role now consists in follo0wing the anti-immigration wave. The 20-10 relationship is now in favor of the Lega Nord and there are no reasons to think that it will change at the next national elections. Third, the Democratic Party, strong in the control room in Rome, loses his strength in the periphery. The party of the PM Matteo Renzi is internally divided and unable to propose a new cycle of reforms. The surprise effect is fading, the promised political scrapping (“rottamazione”) cannot happen simply placing new persons in the key locations by replacing the old ones. In conclusion, the Italian madness. In Campania, Vincenzo De Luca has been elected even if it was clear since the beginning that he would have been forced to resign in case of success. The reason? He was allowed to run as a candidate but not to become President of the region. This legislative conundrum is all but strange in a country like Italy, where the problem is not the absence of laws (quite the opposite) but rather their being contradictory and often poorly enforced. De Luca’s first act after the results of the elections? A lawsuit to Rosy Bindi, President of the Anti-Mafia Parliamentary Commission, charged to list all the candidates who cannot get the position because previously convicted, in accordance with the law “Severino”. De Luca has been condemned at first instance for abuse of power; therefore he was in Ms. Bindi’s blacklist. Nonetheless, 41% of the voters have opted for him, knowing that he will not be allowed to become President.